Traditionally thought of as "barn cats", there are about 87 million free-roaming cats in the U.S.
Everyone wants to see the number of homeless, free-roaming cats radically reduced, but if you can find a humane way to decrease the number and save money, wouldn’t this be the best alternative? Communities trying to solve the problem of homeless cats by trapping and killing them are not only using archaic, inhumane methods but also are engaged in an useless waste of tax dollars, according to an economic study commissioned by Utah-based Best Friends Animal Society. Best Friends’ Focus on Felines® program is dedicated to finding workable community-based solutions to address the issues of homeless cats. 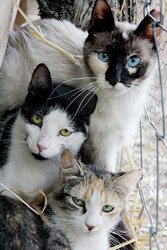 The study, completed by John Dunham and Associates and funded by PetSmart Charities®, serves as core information for a new online “Feral Fiscal Impact Calculator” that, according to Best Friends, will help county and local governmental entities determine the true cost of removing homeless cats by destroying them. With an estimated 87 million free-roaming, homeless cats in the United States, it would cost governmental entities about $16 billion to trap and kill these cats as opposed to about $7 billion for supporting trap-neuter/spay-return (TNR) programs run by rescue organizations and individual volunteers and supported by discounted rates by veterinarians. The Feral Fiscal Impact Calculator and associated study is part of Best Friends Animal Society’s nationwide campaign: Focus on Felines campaign, which is part of the society’s ongoing effort to keep cats safe and out of shelters across the country. Ledy VanKavage, senior legislative attorney for Best Friends said: “With the current economic crisis, cities and counties are laying off animal control staff. Everyone wants to see the number of homeless, free-roaming cats radically reduced, but if you can find a humane way to decrease the number and save money, wouldn’t this be the best alternative? Now more than ever we can use economic arguments to advance humane approaches. “After years of eradication programs, we still have an estimated 87 million homeless cats; and trends indicate this number is rising. Eradication only works on an island. The trap and kill method is expensive and it doesn’t work, so why continue to embrace it? In most American communities, stray cats are a familiar sight. For more than 10,000 years, the species Felis catus has lived beside humans. 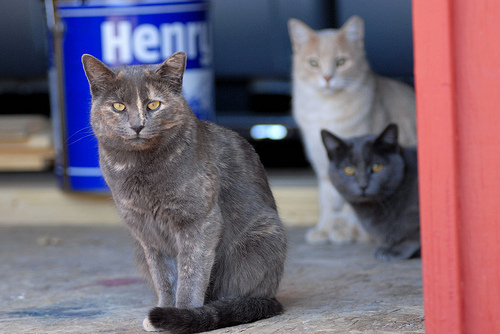 With the growing population of feral (community) cats, there has been much policy debate on how to handle the situation. Some argue for eradication, but this doesn’t curb population growth because some new cats that escape trap and kill will always be born. The humane solution is trap, neuter and return, a cost efficient, no-kill means of reducing feral cat populations. Established in 1994, PetSmart Charities, Inc. is an independent, nonprofit 501(c)(3) organization that creates and supports programs that save the lives of homeless pets, raise awareness of companion animal-welfare issues, and promote healthy relationships between people and pets. The largest funder of animal welfare efforts in North America, PetSmart Charities has provided more than $109 million in grants and programs benefiting animal-welfare organizations and, through its in-store adoption program, helped save the lives of more than 4 million pets. To learn more about how PetSmart Charities is working toward its Vision of a lifelong, loving home for every pet, visit petsmartcharities.org or call 1-800-423-PETS. John Dunham and Associates is a New York-based economic consulting firm that specializes in articulating the economic and fiscal impact of legislation. The firm helps clients by providing economic analyses that translates complex concepts into easily understandable messages. The mission of the Focus on Felines campaign is to keep cats safe and out of shelters across the country. Best Friends Animal Society partners with non-profits and local governments to help achieve a day when there are No More Homeless Pets®. 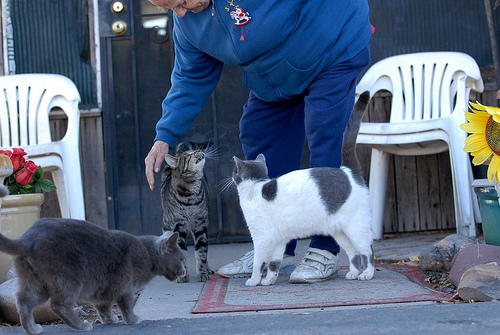 Best Friends implements innovative Trap Neuter Return (TNR) and educations programs to prevent ferals and strays—community cats—from entering shelters. The Focus on Felines web community is a place for cat lovers to meet, share information, and provide support and advice for TNR and community cat topics.